COLUMBUS GROVE — Pitching was on display Thursday afternoon as Columbus Grove and Lincolnview squared off in Northwest Conference action. The Bulldogs’ Alex Schneider was matched up against Lincolnview’s Jaden Youtsey in a key conference clash at the Bulldog Athletic Complex. And it was the Youtsey and the Lancers that got the better of the Bulldogs as Lincolnview walked off with a 4-0 win on a cool, windy afternoon. The win moved the Lancers to 2-0 in the conference and 12-1 overall, while the Bulldogs slipped to 1-2 in the NWC and 4-3 overall. Youtsey had the better of Columbus Grove in this matchup as he threw four and two-thirds innings of no-hit baseball as he went the distance to record the win. Youtsey threw only 89 pitches as he recorded eight strikeouts and walked one. Both of the hits the Lancer righty gave up came in the same inning. Youtsey faced the minimum number of batters through four innings despite giving up a second inning leadoff walk to Grove catcher Brady Hauenstein. Youtsey struck out the next two Bulldog batters as Hauenstaein was cut down between the strikeouts attempting to steal second base. 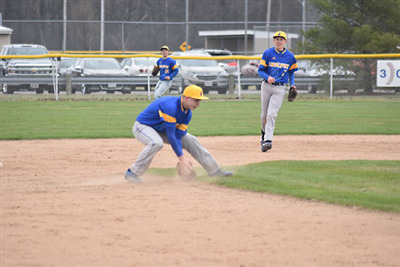 The Lincolnview pitcher retired the first two batters he faced in the fifth inning before Brady Rudasil broke up the no-hitter with a single just behind the second base bag. Kurt Griffith followed with a looping liner to right and the Lancers got out of the inning when their right fielder cut down Rudasil attempting to advance to third base. Youtsey retired the final six batters he faced, striking out three of the six batters. The only run Lincolnview needed came in the top of the first as Collin Overholt walked and stole second base. After an out, Creed Jessee walked and the two runners pulled off a double steal with Ethan Kemler at the plate. Kemler plated the run with a sacrifice fly to right field. Jessee took third base on a passed ball, but was stranded there as Schneider struck out the next batter. After the opening inning, Schneider retired seven straight Lanncer batters before Lincolnview mounted a scoring threat in the fourth inning as they were able to get a couple of runners on base. Columbus Grove kept it a one run game as they cut down the lead runner on a sacrifice bunt, got an infield popup and a strikeout to end the inning. In the fifth inning, the Lancers increased their lead as Cole Binkley singled to center, was sacrificed to second base and took third on a groundout before scoring on a wild pitch. Lincolnview had an opportunity to break the game open in the top of the sixth as they loaded the bases with one out. Kemler was hit by a pitch to start the inning before the Bulldogs got an out when the next batter popped up a bunt the Bulldog catcher caught. Gavin Carter then reached on a bunt single before Landon Price walked to load the bases. A popup to short and a groundball to second base ended the inning. Lincolnview added two insurance runs in the top of the seventh as one run scored on an error and the second on a suicide squeeze play. Kemler had two of the nine Lancer hits with an RBI. Carter and Reece Farmer both had an RBI as all of the teams hits were singles. Schneider took the loss for the Bulldogs as he went five innings allowing two runs on three hits with five strikeouts and four walks. Tayt Birnesser finished the game allowing two runs.